We had a nice day just staying home. We relaxed, connected with a family circle, drew funny pictures of turkeys, ate some yummy foods, visited with Grandma when she and Tom stopped by, watched some I Love Lucy episodes, made some grateful noise with drums and rounded out the day with Flo and I going to see the movie “The Book Thief” at 10pm at the theater down the street. Grateful. 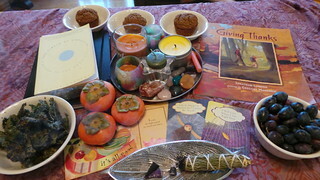 For our Family Circle today, we took the opportunity to talk about gratitude, share memories and enjoy the slower pace of the day. I made some gluten-free muffins for the kids and some nut-free kale chips, so we had some goodies to share while we talked. I always appreciate the momentary simplicity of our family circles; the ability for us all to communicate in one spot, without the interference of technology; without the distractions of routine. It is a purposeful delineation of time and space, set aside for the five of us. I am grateful for the memories made today. If the only prayer you ever say in your life is thank you, it will be enough. It’s remarkable how much you can accomplish if you don’t care who gets the credit. This just highlights the commonality amongst all people, regardless of the lens through which they see the world.